All of a sudden it seams Big Sis has sprouted. The dresses (HERE and HERE) I made her last year were getting tight, and it was time for some new dressy outfits. I raided my stash to make her a skirt and sundress. KCWC motivation to the rescue! 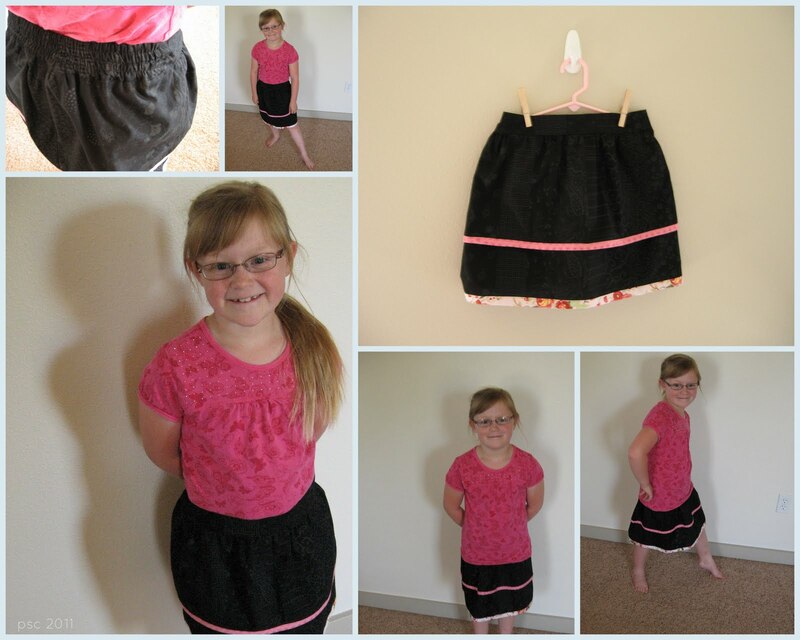 For the tiered skirt, I loosely followed the same method as her last skirt. Sis requested something more fancy, so I added a second tier, and set off the layers with coordinating bias trim. The top trim layer was created by 2" wide bias trim, double-folded. The second trim layer is wider, starting at 3" wide. I made the flat front, like Larissa's tutorial. I actually sewed it this time so that all the seams were covered. I wish I could show you, but with the black, it would not photograph well! My poor camera is on it's last leg. It actually started numbering photos back at zero again. Time to save my pennies. I had a yard of the black print I found on sale, the pink was a remnant from last year's sundress, and the other that lovely Savon Bouquet. Sis has a couple t-shirts that are raspberry pink that will match really well. She tried it on after school Friday. Success! I am a bit sad it only goes to a size 8. All of my cute patterns end at size 8. Crap. Earlier this year I found this sunny print on clearance at JoAnns. Originally I thought I'd use it for my Portfolio dress, but this worked so much better. I did use the remnants of the white contrast from my dress for the yoke and ruffle detail on the hem. The bit of color at the top is a ruffle made from the Meadowsweet 2 line. The ruffle was attached with a French seam, and I added a zigzag detail for fun. This dress also passed inspection, although I need to shorten the ties a LOT. The last item I need to complete is Sister's Banded Peasant Blouse. I'm about half way there. Here's to a happy weekend for all of us! We've had gorgeous weather the last few days. Love both the skirt and the sundress.... and the model is fantastic! It's easy to size up children's clothes, especially simple patterns such as these.... mostly involves adding a bit to the width and a lot more to the length b/c kids shoot up more than spread out at this age. You have been so busy! The garments turned out beautiful and your model appears to love her new outfits. The yellow fabric is so happy and I really like the special touches. 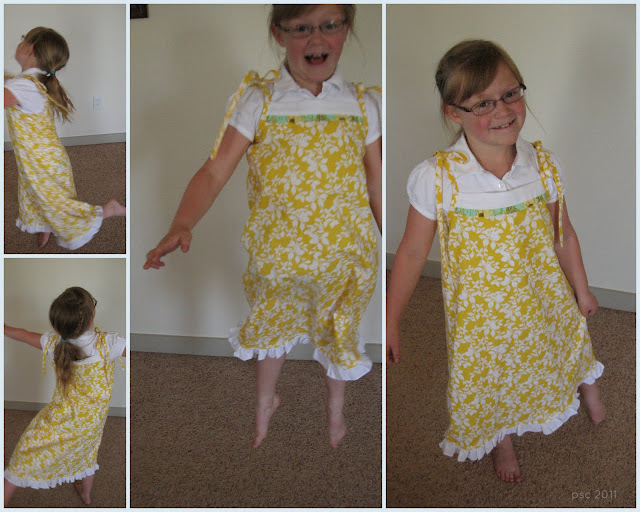 I've been looking for patterns that are plain and not trendy that I can amp up on my own for C.
Love, love...the jumpers little ruffle is especially cute...like the others, I love that yellow fabric! how you get all this stuff done is amazing to me, wow! she really loves the little sun dress doesn't she. always nice to get the thumbs up, eh? lovely work, Chris! so cute! love the yellow dress! I love that yellow sundress...really cute! Cute, cute, cute! I especially love the sundress, and she looks like she does, too. The skirt is gorgeous.....but the sundress is my absolute favourite! It's beautiful!! You are such a clever clogs, Chris. If you weren't so lovely, I'd be considerably more jealous of your never-ending sewing skills! Skirts with elastic waists are great for sprouting girls..you can always attach another strip to the hemline if she has an upward growth spurt mid season! I have always been afraid of this pattern. Hmmm. Your ruffle addition makes the whole dress pop. I'm glad it passed inspection:) I just bought ballpoint needles to make some dresses/skirts for my daughter. She prefers jersey. I need to spend sometime getting to know this jersey...soon real soon.